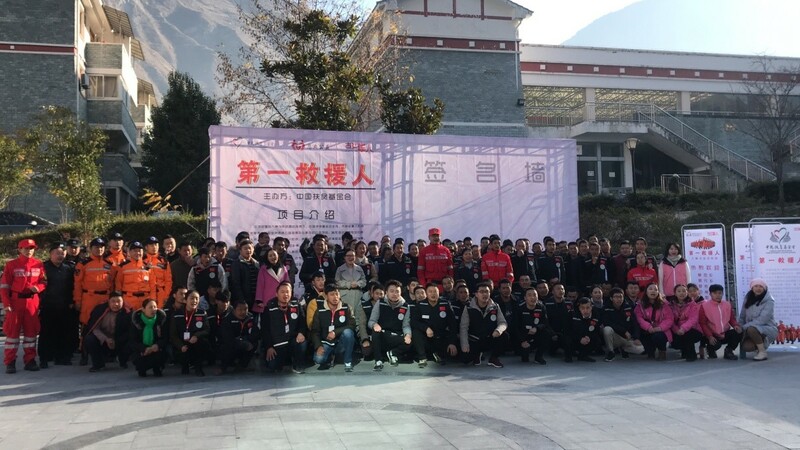 The launching ceremony of the “First Rescuer” project of China Foundation for Poverty Alleviation(CFPA) was successfully held in Jiuzhaigou County, Sichuan Province on November 12.2018. Meng Qin, head of the Disaster Relief Department of Jiuzhaigou County Civil Affairs Bureau, Xu Jiao, Project Officer of Disaster Relief Department of CFPA, Zuo Dihai, Captain of Chengdu Tianhu Emergency Rescue Team, Peng Youran, Party Secretary of Chengdu Story Social Work Service Center, Cheng Weiping, Secretary General of Xuzhou Grace Philanthropy Development Center and 135 trainees from 10 townships participated in the launching ceremony. Designed by CFPA based on the practices of international community disaster reduction projects, “First Rescuer” is a poverty alleviation and disaster relief project that targets the urgent needs of China's community disaster reduction system. This project aims to cultivate community volunteers’ safety awareness, their knowledge of disaster prevention as well as basic first-aid skills. As a result, these volunteers will be able to contribute to disaster reduction education and rescue work when disasters occur. CFPA authorized the Chengdu Story Social Work Service Center and the Xuzhou Grace Philanthropy Development Center to implement the “First Rescuer” Project in Jiuzhaigou County, and the Sichuan Tianhu Emergency Rescue Team to supervise the project implementation. The project will provide professional training for 135 villagers in 10 townships, including Baohua, Yonghe, Grassland, Luoyi, Guoyuan, Biejiao, Yuzha, Dalu, Yuwa and Heihe in Jiuzhaigou. In addition, the project will improve the capability of emergency response team in these townships and purchase emergency rescue equipment for them.